About 99% of the time, Pan Am uses a single engine for Crews to take care of business along the New Hampshire Main. 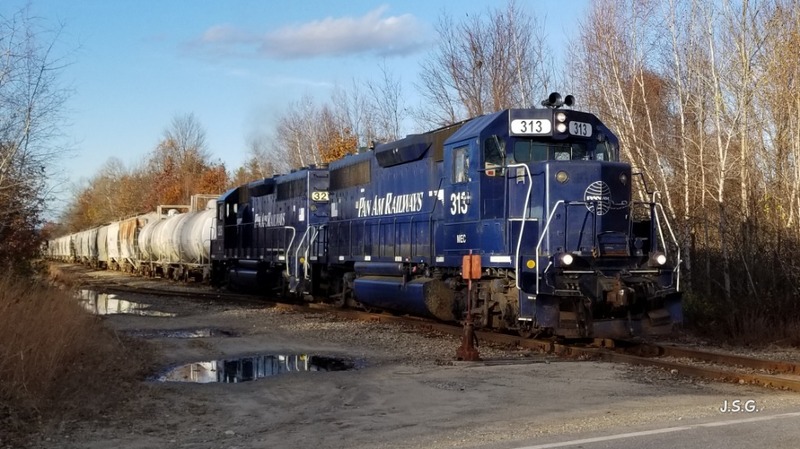 Here was a rare catch with two blue GP40s.. MEC 313 & BM 326 by the River Road Crossing in Bow as the NA-1 crew was getting it done for Ciment Quebec in the late afternoon sun. Looks like 313 received new front and rear number boards since its recent lengthy rotation on these rails last Spring. Photographed by Jay Gadon, November 7, 2018.